Astrophotographer Chris Schur captured this photo of Comet 21P/Giacobini-Zinner on Sept. 7, 2018, when the object was just three days away from perihelion. 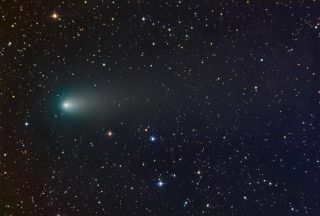 Comet 21P/Giacobini-Zinner made its closest approach to Earth as the object swooped around the sun in September, and astrophotographers around the world have snapped some incredible photos of the bright-green "dirty snowball" in deep space. The periodic comet moves around the sun in a highly elliptical orbit that brings the object close to Earth about once every 6.6 years. As it zooms through the solar system, the comet leaves behind a trail of debris. Every October, Earth crosses paths with this trail of debris, and those "comet crumbs" rain down on the planet. This annual event is known as the Draconid meteor shower, and this year, the meteor shower will peak overnight tonight and early Tuesday (Oct. 8 and 9). In the time-lapse video above, you can follow along with Comet 21P as it traverses the open star cluster Messier 35 (also known as M35 or NGC 2168). Messier 35 is a cluster of stars located approximately 2,800 light-years away from Earth in the constellation Gemini. Steven Bellavia, an astrophotographer with the Amateur Observers' Society of New York, captured the video of Comet 21P with M35 on Sept. 15, 2018, five days after Comet 21P reached perihelion. Astrophotographer Chris Schur captured another image of Comet 21P/Giacobini-Zinner as it passed in front of the open star cluster Messier 35 on Sept. 15, 2018. In Payson, Arizona, astrophotographer Chris Schur also took advantage of the starry backdrop provided by M35 as Comet 21P passed in front of the star cluster. Schur captured the photo above on Sept. 15, 2018, at 2:44 a.m. local time (0844 GMT), when Comet 21P was about 37 million miles (59 million kilometers) away from Earth. "A truly rare imaging opportunity this morning," Schur told Space.com in an email. "The comet traveled right over the Messier star cluster M35 and made for a gorgeous composition. The other star cluster in the field is a background object, yellowed by its distance of 10x further away." Comet 21P/Giacobini-Zinner passes near the bright star Propus (7 Eta Geminorum) in this image captured by astrophotographer John Chumack on Sept. 16, 2018. The next day, on Sept. 16, astrophotographer John Chumack captured a photo of the comet as it whizzed by the bright star Propus (also known as Eta Geminorum) in Gemini. Also visible in this image are the Jellyfish Nebula (IC 443), located near the bottom of the frame, and the Monkey Head Nebula (NGC 2174), located to the right. Chumack captured this 16-minute exposure using a Canon 6D DSLR camera with a 300-millimeter telephoto zoom lens. He was hoping to capture a longer exposure, but clouds rolled in and cut his imaging session short, Chumack told Space.com. "But I think it was just enough to complete the image," he said. "I love shooting with my telephoto for this wide-angle, deep-sky stuff." Comet 21P/Giacobini-Zinner passes through the constellation Camelopardalis on Aug. 22, 2018. In another view of Comet 21P, this one captured by astrophotographer Michał Kałużny three weeks before the object reached perihelion, you can see two distinct tails as the comet passes through the constellation Camelopardalis. The broader of these two tails consists of dust, while the other is "a partially overlapping, fainter ion tail," according to Sky & Telescope. These two tails aren't always so easy to discern, and they often appear as one big, fuzzy blob. Comet 21P/Giacobini-Zinner passes by Messier 37 (also known as NGC 2099), an open star cluster in the modern constellation of Auriga, in this image captured by astrophotographer Alex Babiuc on Sept. 11, 2018. On Sept. 11, Comet 21P passed near the star cluster Messier 37 (also known as NGC 2099) in the modern constellation of Auriga. Astrophotographer Alex Babiuc captured the comet with the star cluster in the photo above by combining 30 exposures of 120 seconds long each. Comet 21P is currently on its way back out into the solar system and is becoming increasingly difficult to spot. But if you miss it, don't worry! The even-brighter comet 46P/Wirtanen is headed our way now and is expected to bring spectacular views by mid-December — even without the aid of telescopes or binoculars. Editor's note: If you capture an amazing photo of comet 21P/Giacobini Zinner or 46P/Wirtanen and you'd like to share it with Space.com and our news partners for a possible story or image gallery, please contact managing editor Tariq Malik at spacephotos@space.com.